English Arts Lesson-"Paragraph of the Week"
AN ENTIRE YEARS WORTH OF WRITING! The purpose of this product is to make your students into more proficient writers through practice and repetition. This product was constructed with the thought of backward design--What do we want these students to be able to accomplish at the end of this product? The answer: We want our students to be independent, strong and proficient writers. 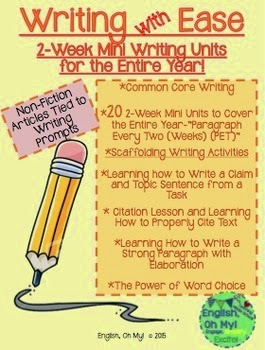 Each mini-unit begins with an engaging article, followed by weekly scaffolding activities. Week one consists of activities on Monday, Tuesday, and Thursday; while week two activities are assigned on Monday, Wednesday, and Friday, with a complete paragraph at the end of each unit. In addition, an easy rubric is included, that allows students to peer-grade, or the teacher can use it as an assessment, writing grade or benchmark. In addition, there are three mini-lessons, a paragraph rubric, and other engaging resources! Every few units provide a new skill that is added onto the prior unit. 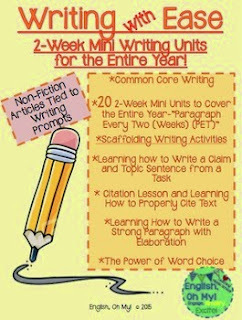 By the end of the 20 units, students will be writing independent, strong and thorough paragraphs. Please come and check out my other products in my store: English, Oh My!